Released in 1991, Terminator 2 was one of the iconic action movies of that decade. In this sequel to Terminator, Arnold Schwarzenegger returned as the cyborg from the future but this time his mission was to protect John Connor, rather than to kill him. An online slot based on this film has been a long time coming and it’s fallen to Microgaming to make it happen in this brand new game complete with live action graphics and numerous bonus features. 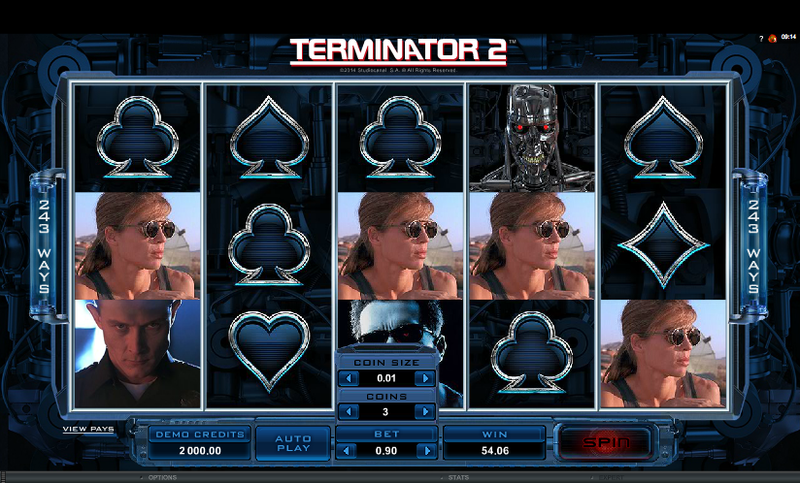 Terminator 2 has five reels and uses Microgaming’s 243 ways to win payline structure which means that matching symbols only have to be in adjacent reels from left to right to form a win. There’s a very metallic and robotic look to the game and it displays mostly in hues of dark blue, black and silver while the music and sound effects are lifted straight from the film. The five main symbols are the main characters – John Connor, Sarah Connor, the original T-800 terminator, the new T-1000 and Arnie himself. Playing card symbols are the lower values. The fiery T2 is wild and there’s a glowing blue portal scatter which activates the main feature. Land three, four or five of the blue scatter symbols anywhere on the reels to trigger ten free spins. During the spins, an extra row will be added to the reel set meaning that there are now 1024 ways to win rather than 243. 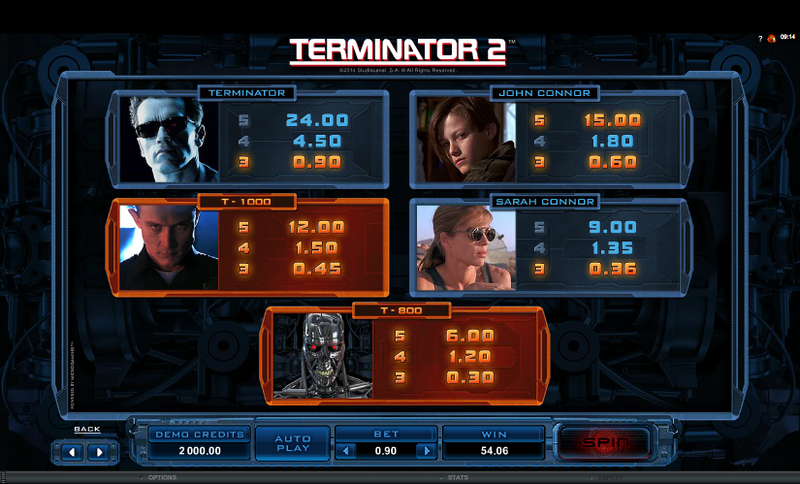 The T-1000 character can transform into other characters here, giving the highest possible win if he does so. Unfortunately more spins cannot be re-triggered. This is a randomly awarded prize during the base game; the screen will acquire a red hue and a target will move around the reels, awarding cash prizes whenever it lands on one of the higher value symbols. If at least one scatter symbols is present, you will also be awarded ten fee spins. Every time you land a winning combo comprising standard symbols it will be noted on the payable as an achievement. There’s no real benefit to this but you can track your progress if you’re a regular player. There’s very little player interactivity here so we can’t offer much in the way of advice; however for the full experience make sure you keep the music and sound effects turned on. This is a very impressive slot from Microgaming; it combines live action graphics, excellent sound effects and lots of bonus features to create a compelling gaming experience. Definitely give it a go.